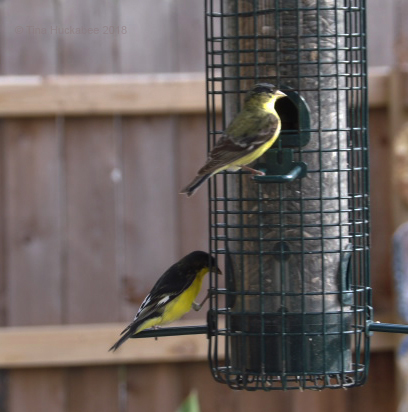 This entry was posted in American Goldfinch, Blue Jay, Blue Orchard Bees, Cedar Waxwings, Green Anole, Orange-crowned Warbler, Ruby-crowned Kinglet, Uncategorized, Yellow-rumped Warblers and tagged Urban Wildlife, Wildlife Gardening, Wildlife Wednesday by Tina. Bookmark the permalink. You have a truly beautiful and interesting collection of birds around you! Thank you, Jane. It’s a great time of year for the garden and its inhabitants. 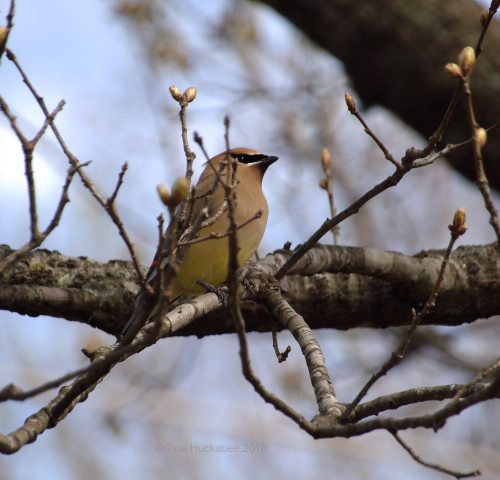 My Cedar Waxwings and Goldfinches have left awhile ago. 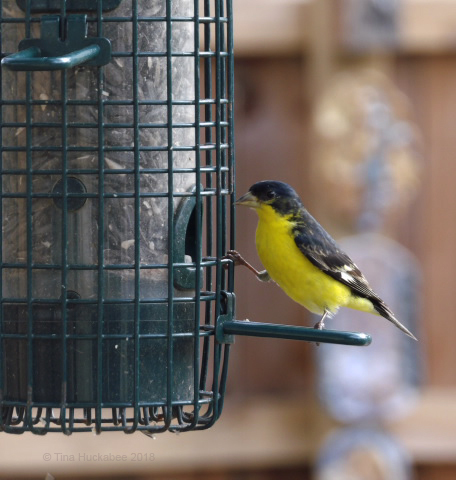 The Goldfinches always leave when I buy the second bag of niger seed. We are having a good year with anoles and skinks. 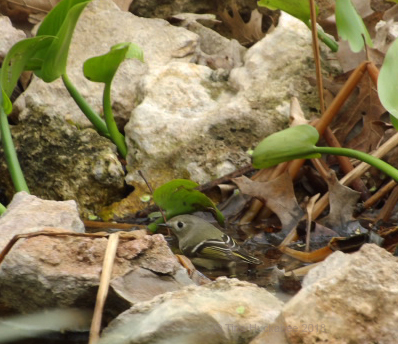 Your photos are great as usual and a good way to identify Texas birds. Thanks, Judy. I’m sure you miss them, I know I’ll miss my visitors. Great photos again, Tina. 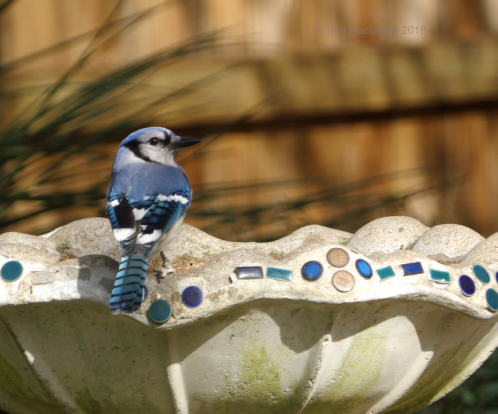 Blue jays look so ‘designer’! You say chatty, does that mean noisy? 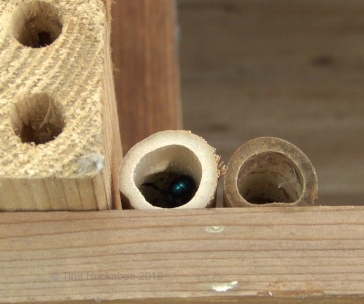 Also, seeing your bee hotels made me wonder how deeply drilled your blocks are? I was having a go with some bits of sawn-off tree trunk and I’ve been drilling to ~6-8cm. Do you think this is enough? Good luck with your hotel–I look forward to the coming photos and posts! Tina the photos are magnificent. The Blue Orchard say goodbye until next year and need more rooms. It’s fantastic! All the birds are beautiful. The Spinus tristis are beautiful. The lesser goldfinch is lovely. The cedar wakwing is divine. 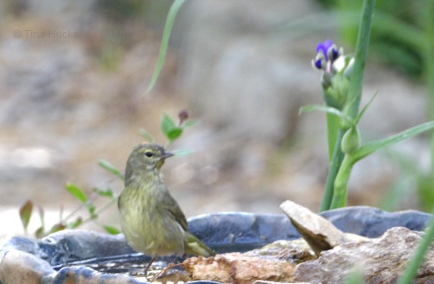 The yellow-bellied warbler is cute like the orange-crowned warbler. 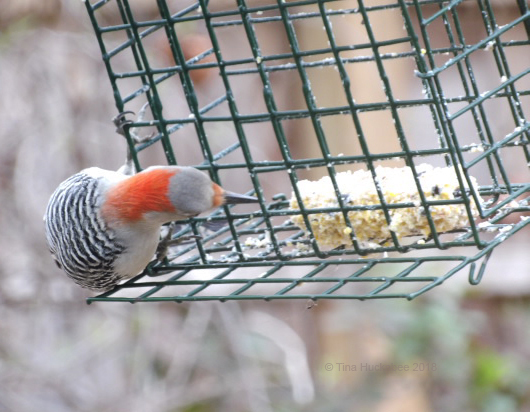 The red-bellied woodpecker is beautiful. The Blues Jays are wonderful. Finally my friend the lizard! 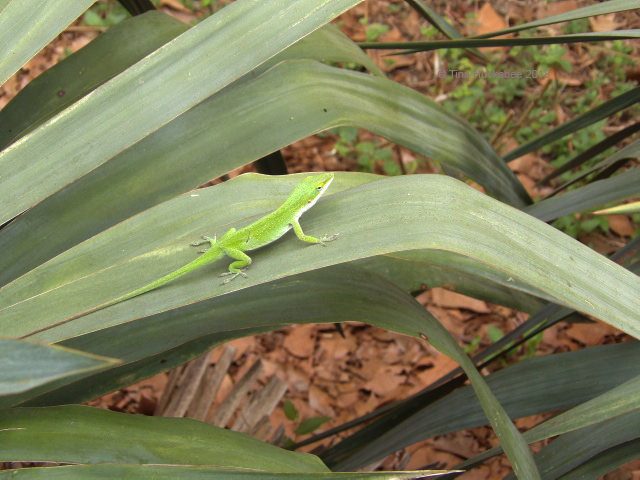 The Green Anole I love. Happy wildlife gardening too for you. Long live the wild life! Have a nice week. Greetings from Margarita. Thanks, Margarita. I enjoy watching these critters and am glad that you enjoy looking at them! You have a good week, too. I’m going to try this and hope I have it right! Gracias, Margarita. ¡Disfruto viendo estas criaturas y me alegra que disfrutes de mirarlas! Tienes una buena semana, también. I’m just certain I’ve had the same bluejays (or their offspring) for several years now. It never fails – – about the end of February one shows up and announces his presence. Then, I put out the peanuts in the shell, and it’s bluejay city for a while. I think I might have some young ones coming now, but there clearly are babies still in the next. The constant flights back and forth to pick up another peanut certainly suggest it. Of all the critters I’ve seen this spring, the most interesting were a pair of huge, flightless beetles I noticed on the Willow City loop. I can’t remember the name right now, but the common name is something like “Giant, freaky beetle.” The folks at Bug Guide identified it for me. The prettiest things I’ve seen this year? A group of eight axis deer, with three fawns. No photos of those, because all I did was gawk. But sometimes that’s enough! 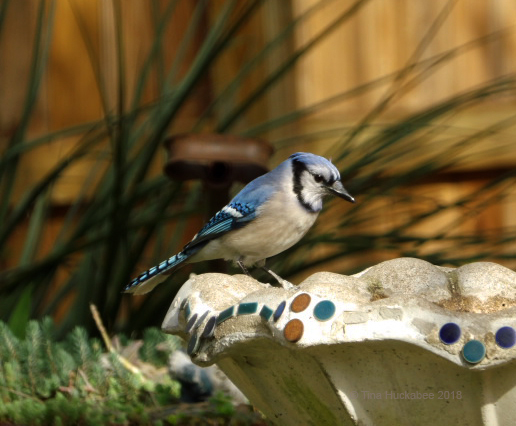 Blue jays do love their peanuts–I’m just sorry I didn’t discover that until recently. Interesting about your beetles and I can’t wait to read about the mystery plant. I have a mystery plant myself. It’s supposed to be Drummond phlox (I bought the seeds from the LBJWC), but they sure aren’t any phox I’ve ever seen. Still trying to figure that out. I’ve bought plants there before that were mislabled, so, yeah. I really like their…mostly everything, but I wonder sometimes about plants-for-sale product quality. As for the deer, I’ve also been so entranced with an experience that it almost seemed profane to take a camera out. Some things should just be. *Correction* I finally dug through the container of seeds that I scattered last fall and, in fact, didn’t purchase the Drummond phlox from LBJWC, but from Wildseed Farms. 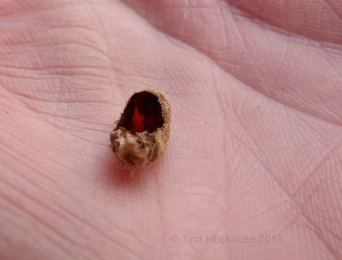 I’ve contacted them, sent photos of the non-phlox and the packet of seeds, The “customer care administrator” suggested that the plants look invasive and that I should remove them before they bloom and seed out. There was no apology for selling bum seeds and no explanation as to how that happened. I have purchased plants from the LBJWC plant sale that were mislabeled, but have always been pleased with the seed quality. Going forward, II’ll gladly share seeds with knowledgeable gardeners, purchase from the LBJWC, but I’d probably not purchase, nor recommend, Wildseed Farms. 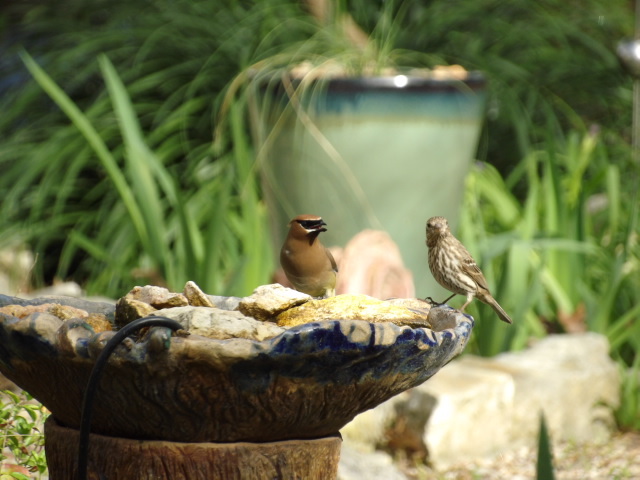 Yes, the birds are here regularly and I’m certainly hoping for a good migration season! 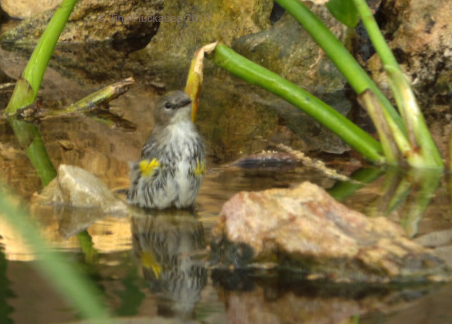 Great capture of the Kinglet! I do see them sometimes, but we’ve never gotten a photo. 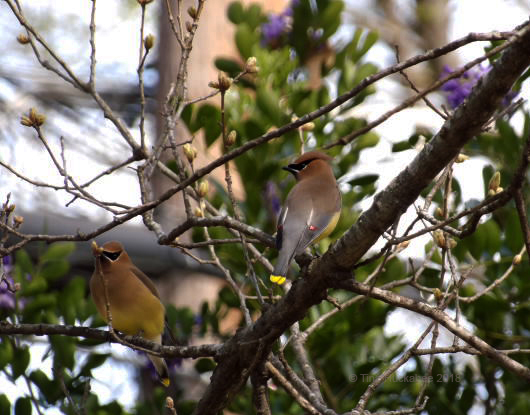 We’ve only ever had one Cedar Waxwing visit our garden. 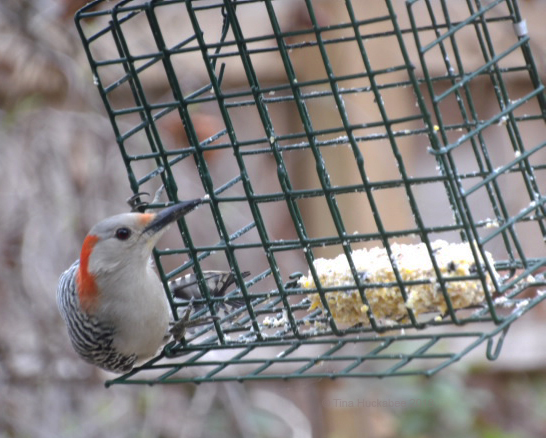 We do get plenty of Goldfinches, Red-Bellied Woodpeckers, and Bluejays. Thanks, Jason. Catching those little sprites is (for me) dumb luck–but I’m so happy when it happens! 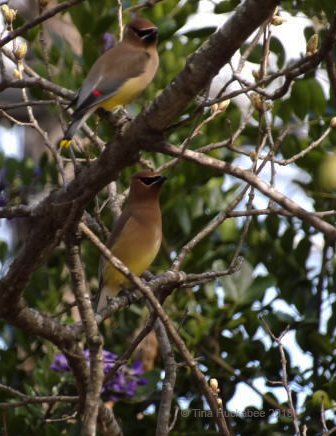 Interesting that you don’t see Cedar waxwings, I thought your neck of the woods might be a summering ground for them. It is, but they just don’t come to our garden. Lovely captures of the avian visitors to your garden Tina, and I love the green anole and glad to see him return to your place. 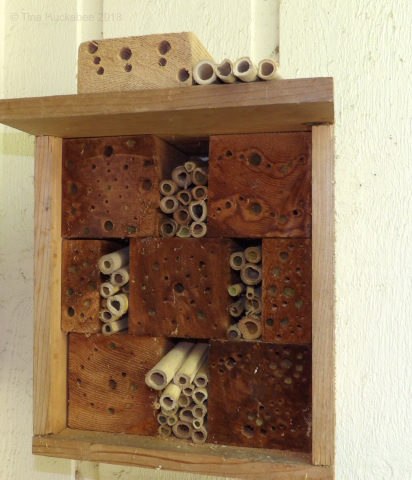 It’s great to hear how your bee hotels have filled up with guests, we all know the world needs more bees! 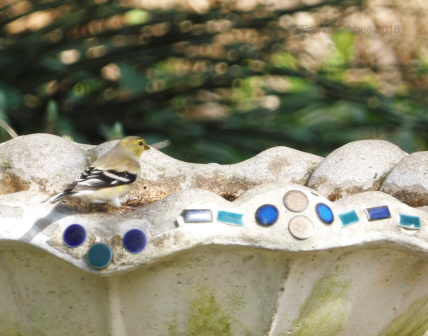 Goldfinches are so pretty, but I had an incident with a whole herd of them a few years ago when they came into my dining room to eat sunflowers I cut and brought in! They are pretty and I can imagine that they’re cheeky. A herd of them makes a lot of poop. 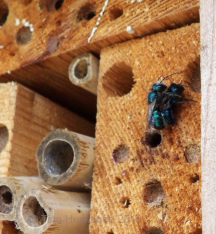 Those bug boxes look really full! 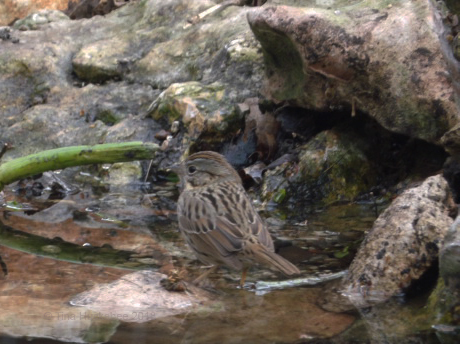 I love birds like Lincoln Sparrows, they are like Dunnocks here–some call them ‘little brown jobs’ and some call them dull. I hate it when they say dull. The color and markings are usually subtle. 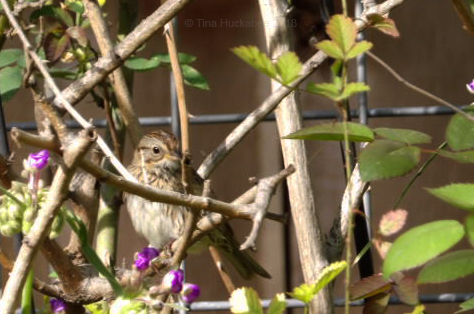 For instance, dunnocks look like they have little tiger stripes down their back. 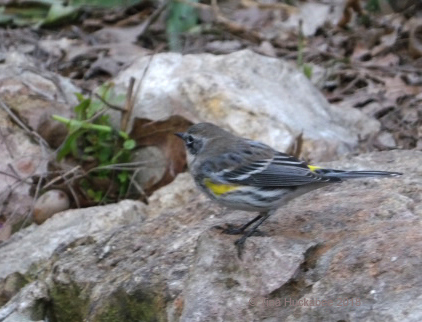 It’s easy to love those brightly colored birds, but I really love the subtle patterns of some of the “dull” ones. I’ve heard the term “little brown jobs” but don’t much like it. There just isn’t a bird that has boring or uninteresting plumage. Says me! 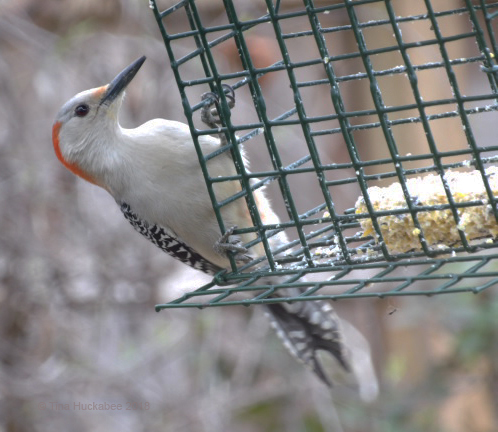 It doesn’t appear there is any red belly on the male red-bellied woodpecker either… How often do you wonder about the naming conventions of birds? Rehabbing birds is difficult, apparently. I’ve “rescued” birds, only to see them die before I could get them to someone who knows what they’re doing. I do understand the sorrow and guilt, though. Oh gosh, I love those anoles! I’m always thrilled to see them when we travel to the south. They’re so cute and seemingly tame. 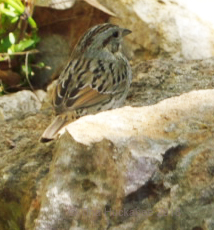 Most of the birds you show here also show up in my garden–some in the winter, while some are more prevalent in the north in the spring and summer, during their breeding season. Great photos! The pics of the anoles are just for you, Beth. 🙂 They are real charmers, even when they give me the stink eye.